Puccinia aizazii, a new rust fungus was found on the leaves of Jasminum humile growing in the Margalla hills near Islamabad, the capital city of Pakistan. 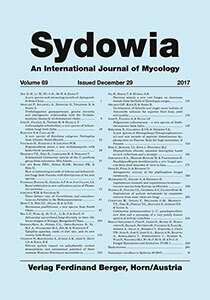 The new rust species is distinguished from all other previously reported Puccinia species on Jasminum by having aeciospores and a set of morphological features. Keywords: new taxon, Oleaceae, Pucciniales, taxonomy, Uredinales.